I became a Sister for the love of Jesus… I remain a Sister because of the love of Jesus. After graduation I asked the parish priest if he would write a letter of recommendation to Maryknoll for me. The pastor, a Josephite said, “Indeed not; all that community is going to do is make you a domestic. I will send you to the Oblates in Baltimore.” I knew no Oblates, had never seen an Oblate Sister of Providence. But God has a habit of putting you right where he wants you to be, and so I came to Baltimore; did the things necessary to become a novice, professed first and then final vows, when I received my ring. The ring symbolizes that one belongs totally to Jesus Christ. Since then, I have held many positions: teacher, librarian, Director of Religious Education, Formation and Vocation Director for my Congregation and now Director of the Cause for the Canonization of Mother Lange. However, there are none which have had as much meaning for me as this latest appointment, because my relationship to the saintly Foundress has deepened through the years. As a writer, I love to make Lange the subject of my poetry. Presently I am Director of Religious Education at Historic St. Francis Xavier in Baltimore. I perform a double ministry, but I am not worried. Mother Lange knows my allegiance to her and to the Oblate Sisters. I feel that the beloved Foundress will be assisting me in all the Lange Guild duties I must perform in the days, months and years ahead. It is not easy but what is easy? 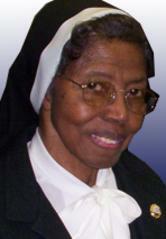 On August 15, 2009, three of my group and I celebrated our 60th Jubilee as Oblate Sisters of Providence. All glory, honor and praise to our good and gracious God for allowing me this grace to be of service.